Welcome to the Internet home of the biggest small village celebration in Wisconsin — Bristol Progress Days. For three days in July, Bristol in western Kenosha County Wisconsin, becomes the site of good old family fun. 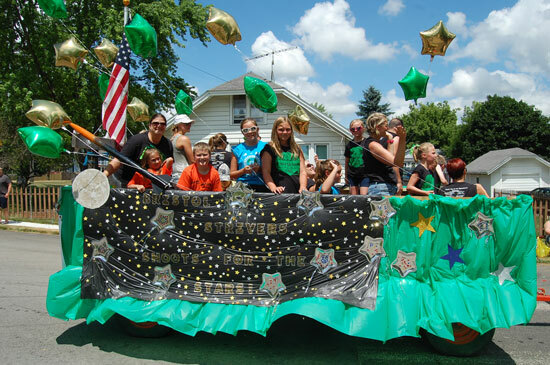 Whether it’s sports tournaments, carnival fun, kids’ activities, music, history or the parade famous for the candy rained down on its spectators, Bristol Progress Days has something for everyone. And don’t miss the fireworks on Sunday at dusk. Explore this site for more information on the many facets of Bristol Progress Days. Did you know that you can support Bristol Progress Days while you shop on Amazon? If you shop Amazon Smile, Progress Days will get a donation with every purchase. Here is the direct link: http://smile.amazon.com/ch/39-1997451. Thank you for your support. Watch the awesome aerial video of the festival courtesy of American Vision Aerial Photography!